Good front and back wraparounds are rare in newspapers. The story has to be big enough to warrant the show and the picture has to be good enough to justify running across two pages. 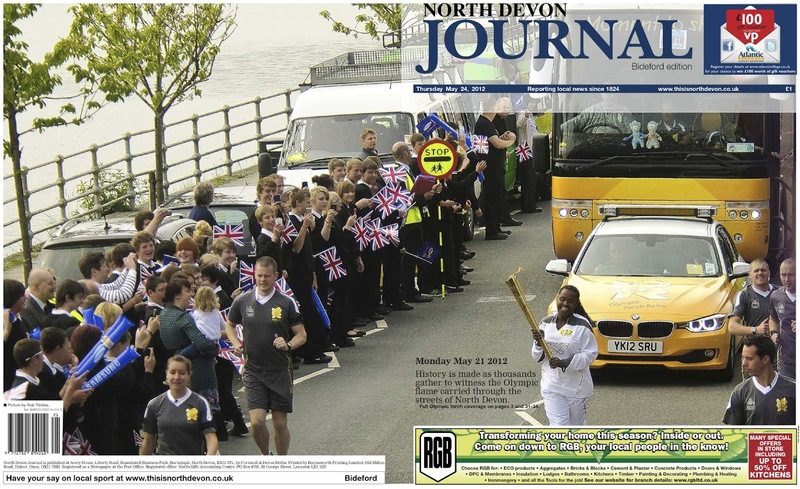 So well done to the North Devon Journal in using four first class wraps on the same day. I am not sure this has ever been done before. 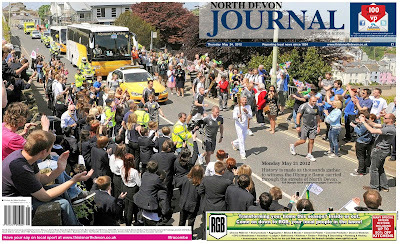 The story, the Olympic torch going through Devon, was certainly big enough. All that remained was to ensure the pictures were good enough too. The paper planned in advance where the photographers would be to ensure they had the perfect shot for each edition - Barnstaple, Holsworthy, Bideford and Ilfracombe. 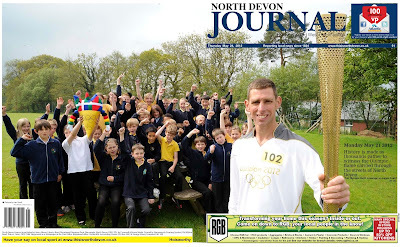 The Ilfracombe edition shows the very moment Jonathan Edwards burst into tears as he ran past his childhood home. 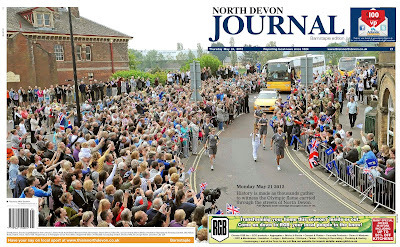 The event has been billed around the towns as “Don’t Miss Our Olympic Torch Collectors’ Edition” and the papers will certainly look striking on the news-stands. Well done to newly-appointed editor Chloe Hubbard and her team. I hope they sell out! 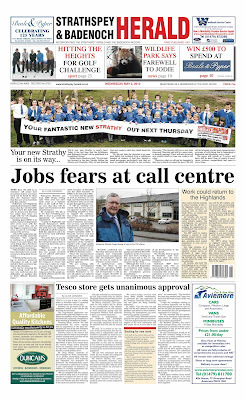 The Strasphey and Badenoch Herald went compact on Thursday, marking the start of a new period for the paper. 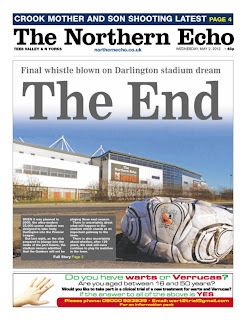 For me and colleague Mike Brough, though, it was the end of a fascinating project that began almost two years ago. 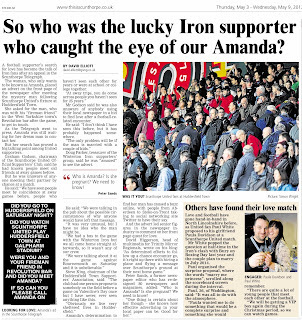 In June 2010 we were asked by editorial director David Bourn (a fellow Geordie boy and Newcastle supporter who used to edit the Norwich Evening News and was deputy editor of the Hull Daily Mail) to look at his newly acquired portfolio of papers. Since then we have helped the editors in Northern Scotland redesign the Inverness Courier, the Highland News (see the changes here), the Northern Scot, the Banffshire Journal and the Forres Gazette. The change to the Strathy, though, are the boldest. It's a hugely popular title and taking it from its text-heavy broadsheet format to a lively compact is, inevitably, a risk. The early signs, I am pleased to say, are very positive. Gavin Musgrove, the Strathy's editor, emailed me on the day of the relaunch to say: “The initial feedback this morning has been fantastic and our fingers are crossed that this will turn into extra sales and advertising revenue this week and for the road ahead. I’m absolutely delighted with the results of the redesign." 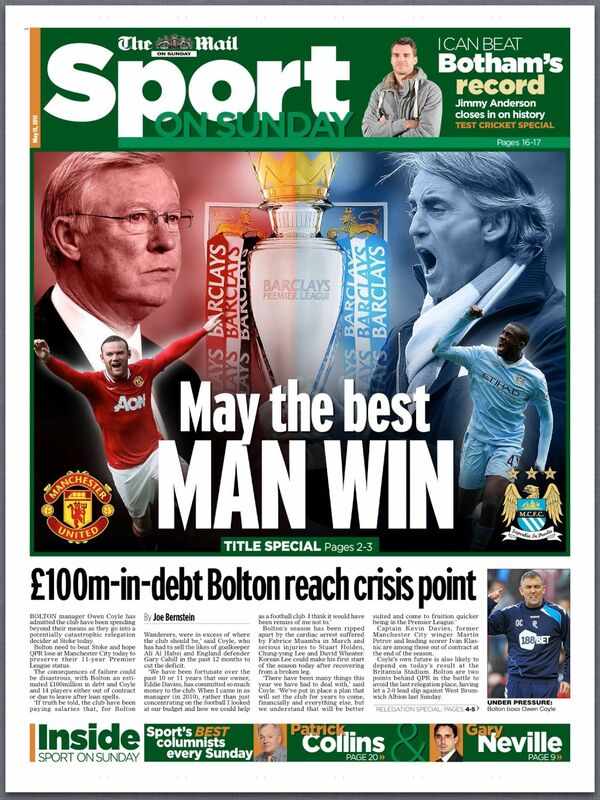 The paper looks great but there have been tough decisions on the way. Taking one of the most successful titles in the UK and radically changing it wasn't something embarked on lightly. 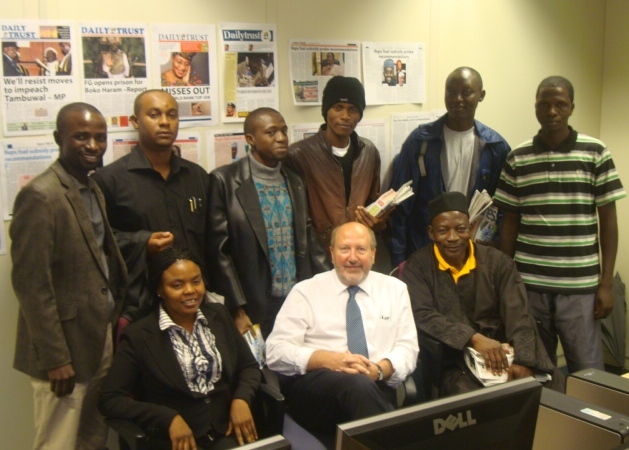 Gavin said: "It was not an easy step to take as an editor or for Scottish Provincial Press. Our sales have held up well at a time when many other titles in the UK are suffering declines. “However, the time had come to freshen things up. Whilst the appearance of the Strathy has changed radically and there is plenty of new content, the emphasis is still very much on local news. That is our unique selling point." And Gavin (also a Newcastle supporter) was kind enough to give the SMS team a mention too. “Peter came up with some very thought-provoking concepts on what a new Strathy could look like which really got the whole process off to a flying start. 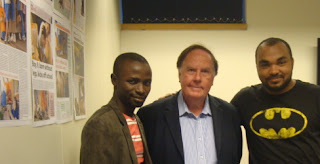 And the contribution made by Mike in bringing our vision to reality cannot be under-estimated. I was hugely impressed by his expertise – and he was a pleasure to work with, which always helps." Thanks Gavin, it was our pleasure too. The Strathy looks modern and vibrant and is rammed with great content. My only sadness is that our role has finished ... not only because we will miss the Geordie exiles and native Highlanders but also because the Castle Tavern in Inverness has become one of our all-time favourite pubs. 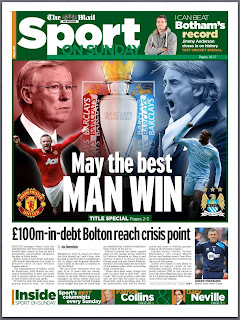 Still, I am sure the papers will need some training, consultancy, conference, publishing work in the near future. Won't they David? Football dominates tomorrow's agenda. 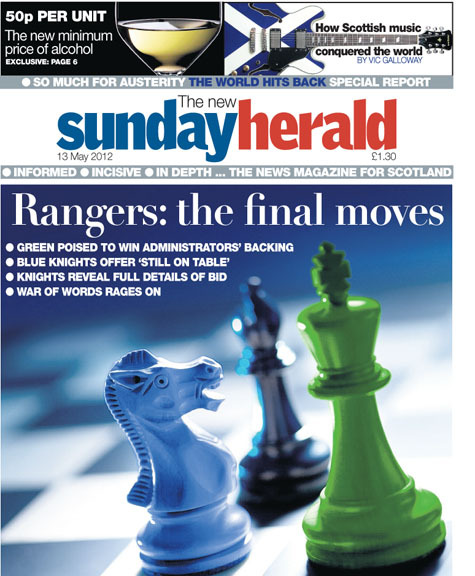 So here's a couple of cracking pages from the Herald and the MoS that reflect the highs and lows of the beautiful game. 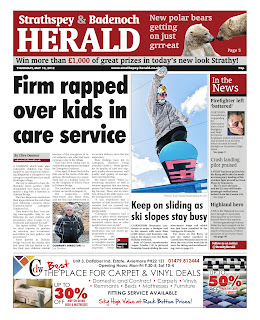 Excellent designs, powerful visuals, great headlines that talk to the pictures and stylish, effective blurbs. Warms the cockles of your heart. 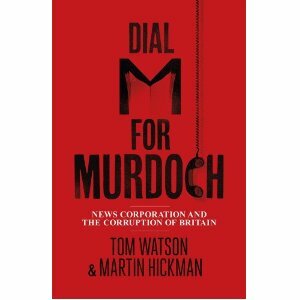 The book, by Tom Watson and former Hull Daily Mail journalist Hickman, is essential reading of course. But if you haven't found time yet you could do worse than catch up with David's synopsis. * If the time is fast-approaching when you start thinking about your beach reading for the summer, take a look at my list of newspaper novels. Here's a curate's egg of a page from today's Times. The picture of Rebekah is stunning, sharp, nicely cropped and positioned. She was yesterday's main player and there she is, in full flow, staring out of the page. It will undoubtedly be the first thing the reader sees. The headline above her is spectacular. 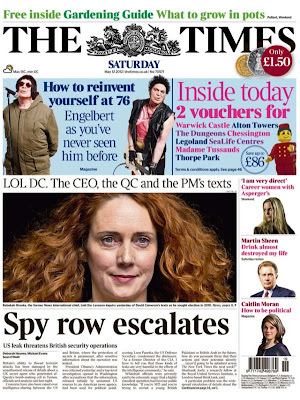 I have never seen a front page headline (or in fact any headline) with five abbreviations before. Talk about cryptic. You need to know the story to understand it but that's OK. Making AB readers work a little for their headlines isn't really a problem. But it isn't Mrs Brooks and the crossword puzzle clue of a headline that will drive sales today. The paper is working hard to ensure its blurbs will encourage the casual readers to slip a copy into their shopping trolleys. They work too, at least to a point. The Engelbert pictures are intriguing - who could resist the Eurovision oldie as Liam Gallagher or Sid Vicious? But why two headlines? Engelbert as you've never seen him before is enough.The second blurb is just what readers need in these straitened times - money off vouchers for a day out with the kids. But the headline, Inside today, is one of my biggest bugbears. Inside: Where else would it be? In our rival's publication? Behind the bacon counter? Today: When else would it be appearing? Yesterday? Next Thursday? The same applies to Free inside on the gardening blurb. The words Inside, Today, Also, Plus and Free are regularly used in blurbs - and are just a waste of ink and newsprint. The Times blurbs are good on content but too cluttered. Why bury the message? The celebrity blurbs down the right are effective teasers (notice that they don't need to explain to the readers that these particular stories are inside). I would buy the paper for any of these, especially Caitlin Moran who is essential reading. Finally we come to the splash. Once upon a time newspapers used to sell themselves on their lead story. Now, tucked away at the bottom of the page, this is by far the least interesting element of the page (except for the bar code of course). So there's the Times as it is today - seven pictures, six teasers, five abbreviations, four-column lead, three-word splash headline, two news-items and one bar code. Then there is the back page ... a stunning sky blue piece of artwork, which takes in the titlepiece, and sets the mood for tomorrow's Premier League finale. Bold, and innovative. The story underneath is presumably to add a bit of balance ... but I might have been tempted to wipe out the whole of the back. It's certainly all a far cry from The Thunderer of yesteryear ... and hard to believe that it's only eight years ago that the crusty old broadsheet turned compact. Some of you might be interested in an update on Amanda's search for the man of her dreams. 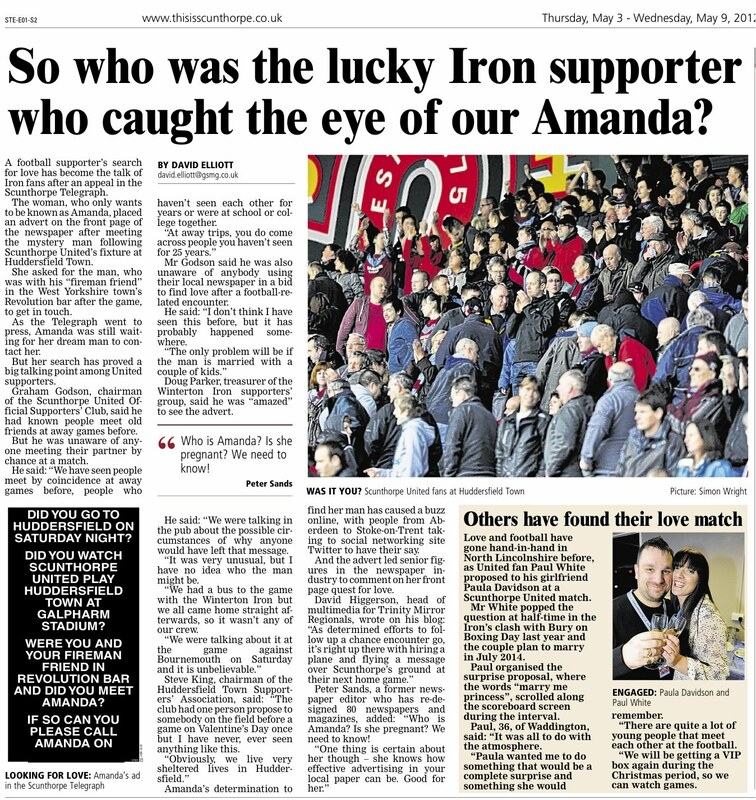 I posted the story last weekend of how Amanda took out a front page advert in the Scunthorpe Telegraph trying to track down the man she met at the Huddersfield v Scunthorpe match. Sadly, it looks like Amanda is going to be unlucky in love. Despite her innovative spirit and understanding of the power of the press, the Telegraph reports that the mystery man has not yet come forward. Perhaps the page lead and re-running the advert for free will encourage the elusive fireman to make contact. Remarkably, I am quoted in the story. As Essex Chronicle editor Alan Geere observed, you know you've made it when you're a pull-quote in Scunny. Wow. Here's a typographical peril I have never encountered before. What else can I say? Thanks to @SimonNRicketts for the tip, Imgur for the picture and @David_C_Lewis for the headline. 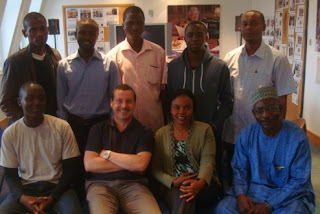 I said goodbye to nine Nigerian newspaper designers and editors today. They flew back to Abuja after two weeks at the Press Association offices in London where we have been helping them redesign the Trust titles. They had sessions with picture specialist Alun John, software training with Ti Majek and four intensive hands-on design days with Mike Brough. Their first week was seriously disturbed by news from back home that a bomb had gone off at neighbouring newspaper Thisday, and nine people were killed. 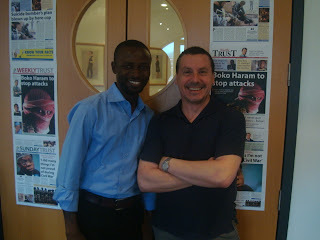 It emerged later that Nigerian newspapers and their journalists are now targets of the sect Boko Haram. In a remarkable video, posted on YouTube after the attack, an anonymous man lists 11 newspapers and puts them in three risk categories. He says Thisday, in Category 1, was attacked for publishing 'inaccurate and biased information' about Boko Haram. The Daily Trust is in Category 3 and has been warned it will be targeted unless it stops publishing 'falsehood' about the sect. It certainly puts some of the issues we are facing in UK newspapers in perspective. Despite the worries about what was going on at home, the nine enjoyed their London stay, were great company and produced some exceptionally good pages. I wish them a safe return and look forward to the next time. I am running an intro to subbing course in London for the Press Association next Tuesday and Wednesday. It should be a fun two days that look at the nitty gritty of what modern subs do. We will be doing some text-editing, rewriting, a bit of grammar if you need it, headline writing, use of pictures, captions and an intro to layout on InDesign. There are a few places left if anyone is interested. You can book a spot by emailing shirley.kelly@pressassociation.com. I am also running a two-day layout and design course on June 12 and 13. Might see you there. Here's a very strong front page from tomorrow's Northern Echo covering Darlington FC being forced to leave their stadium. It's been a sad day for the town. The paper's editor Peter Barron says the picture was taken months ago, although he hoped he would never have to use it. It's a great image that sums up the story and shows that Peter has lost none of the forward planning skills he had when he was my news-editor 20 years ago. Top notch.